One of the new Charge trucks to appear at Formula E races. British automotive company Charge has partnered with Formula E to supply electric trucks to circuits in flagship cities worldwide. To be used for drivers’ parades and on- and off-track logistics throughout the race schedule, the electric trucks made their debut at the 2016 Visa Paris ePrix over the weekend. "We are proud to partner with Formula E, everything they are doing is aligned with our company mission and values," Charge CEO Denis Sverdlov says. "The truck and bus industry has stood still for many years, we are creating a highly efficient, affordable, environmentally superlative truck offering that we believe will transform major cities around the world. "This partnership allows us to work closely with leading logistics companies like DHL where we can showcase our technology and the opportunity for every logistics company to revolutionise their fleets, resulting in huge savings to their businesses and improving their social and environmental impact." Being the official logistics partner for the Formula E, the Charge vehicles are covered in DHL's colours - something that could be more common in the future off the race track. 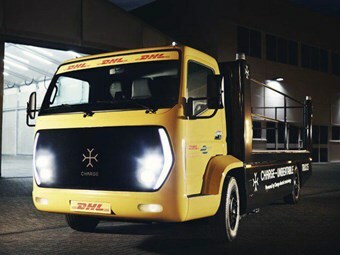 "Having Charge as the official electric truck partner is a great addition to the Championship," DHL global sponsorship manager Sabrina Asendorf says. "We see huge potential in the contribution they can make to advancing technology for commercial usage and the way we envisage the future of logistics." Based in the English county of Oxfordshire, the truck maker says it is "re-defining the way trucks should be made with a fully integrated software solution that enables the hardware to be instantly upgraded with every aspect of the vehicle connected." While Charge hopes to grow in employee numbers and production scale, the company’s new partnership with Formula E "makes sense on every level" according to Formula E CEO Alejandro Agag. "They are an incredibly innovative company, the way they are approaching the electric truck and bus market with software that improves the hardware is very intelligent and it means our entire series from the cars to the trucks is completely electric and that’s a powerful message for change," he says. "I’m sure Charge will be the future of trucks and buses and we look forward to helping them grow."